Caramava Ads are commercial advertisements displaying by Caramava adware application. This application usually arrives bundled with a list of other freeware applications. Computer security experts suggest that this program is a potentially unwanted application that may inadvertently expose you to potentially corrupted websites. Therefore, it is vital that you remove Caramava Ads from your computer before the application manages to cause any harm. Even though it seems that the program is useful and can improve your web search experience, it is very far from the truth, and you should never believe it. We can firmly say that no good comes with Caramava Ads. After all, the adware program behind these ads belongs to SuperWeb LLC group of adware applications. There is an entire clan of identical adware apps from this group, and all of them are very predictable. Whether you have encountered CrankWeb, Focusebase, Okiitan or any other similar application before, you will know exactly what to expect of Caramava Ads. Needless to say, that caramava.com does not function properly. It is supposed to be the official website for the application, but it is merely an empty shell that poses as a legitimate distributor. What is more, the information provided at the website is useless and misleading. For example, the “vendors” claim that Caramava is compatible with all main browsers, but during our tests only Mozilla Firefox and Internet Explorer were affected by this application. Not to mention that clicking Start Now button does not give any result – the direct download link is not working, so it is impossible to download Caramava Ads program at the official website. That being said; we can clearly say that Caramava Ads always comes bundled with freeware. As a result, users are often encouraged to apply various safety measures while browsing the Internet because it is easy to download unwanted and unnecessary software accidentally. Chances are that with Caramava on board, you also have other random applications installed on your computer, and they constantly slow down your system performance and your Internet connection. On the other hand, we have to point out that Caramava is not a malicious computer virus. This program merely tries to make financial profit for its creators. Users allow the program to manipulate them! After all, no one orders you to click Caramava Ads, you do it yourself. However, you should never click any commercial ads delivered by unfamiliar applications because they might redirect you to unsafe websites or even initiate unwanted or dangers software download. Hence, in order to protect yourself and your system from potential harm, you have to remove Caramava Ads right now. You simply need to uninstall the application via Control Panel. Do not forget to check the list of Extensions on Mozilla Firefox since you might need to delete it manually from there. Eventually, after manual removal you are strongly encouraged to invest in a licensed antispyware tool that would protect your system 24/7. Highlight Caramava and click Uninstall button. Go to Uninstall a program and remove Caramava. 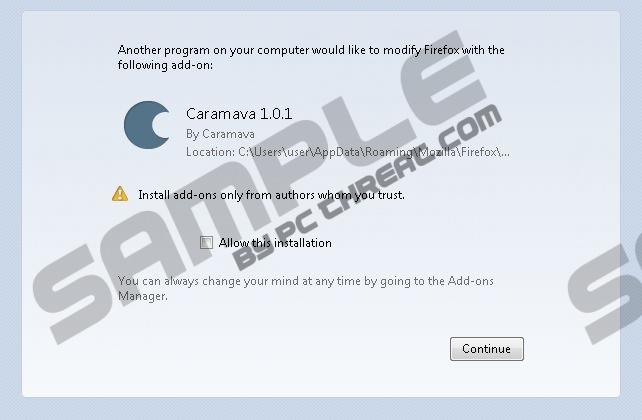 Select Add or remove programs and uninstall Caramava. Quick & tested solution for Caramava Ads removal.